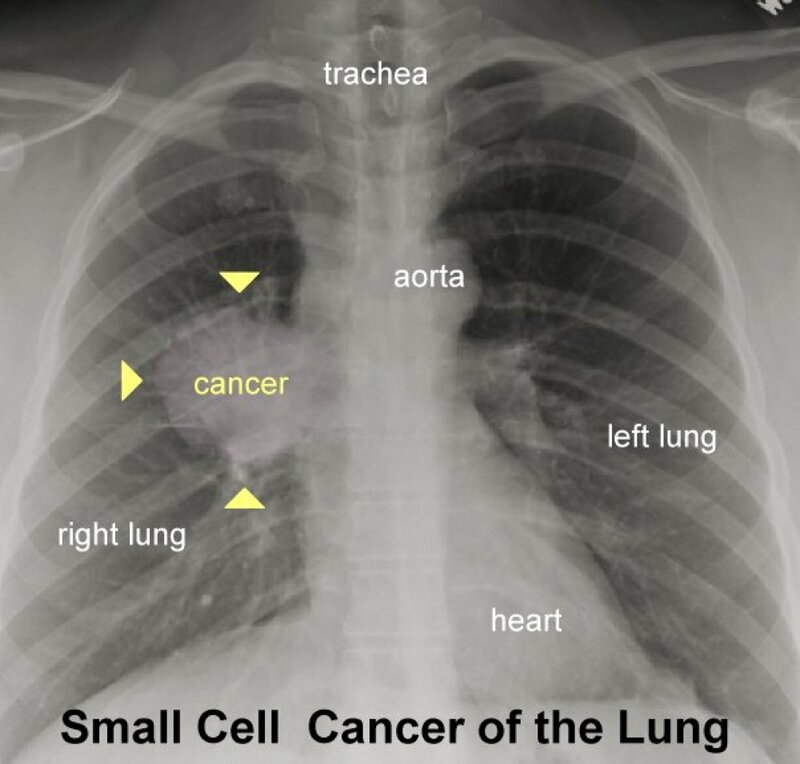 Cancer sticks are commonly used in correlation with reasons why people should quit smoking. This is because smoking cigarettes is known to infect your lungs with various chemicals which can cause cancer, and ultimately death. There are many people around the world who are determined to encourage smokers to quit smoking with anti-smoking campaigns. Some are even aimed at banning tobacco all together. 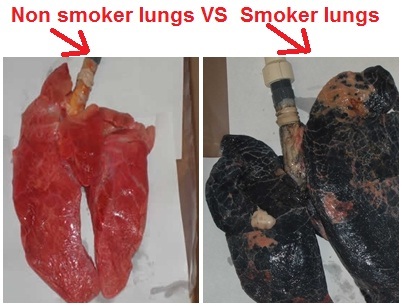 One thing that several of these campaigns have in common is their colorful smoker's lungs pictures, which shows people the damage they are doing to their own lungs. How Does Smoking Affect Lungs? Smoking has several short-term and long-term effects on your lungs. The affects range from mild coughing, colds and wheezing to the more severe chronic asthma, pneumonia, emphysema, lung cancer, and death. Fact: 84% of lung cancer deaths and 83% of chronic obstructive pulmonary disease deaths are caused by smoking. The most common of the effects of smoking is COPD (chronic obstructive pulmonary disease), which is an extremely debilitating disease. COPD is diagnosed when you have a collection of various lung diseases, including chronic bronchitis and emphysema. Once a person has been diagnosed with smoker's cough, it will quickly progress into COPD if they do not quick smoking. Those who have COPD find it very difficult to breathe because their airways are narrowed and their lung tissue is deconstructing. Some common symptom you will experience due to COPD including increased difficulty breathing while being active, consistent coughing with phlegm, and frequent chest infections. Your mucus becomes thicker because the mucus producing cells grow both in size and quantity. You will begin to cough because of the buildup blocking your airways, and all that extra mucus makes it easier for infections to develop. The cilia in your lungs, which clean the air as you breathe, begin to slow down and die. One cigarette can slow the cleaning process for hours. Additionally, fewer cilia in your lung will work to clean the lung. As you smoke your airways become irritated, inflamed and begin to narrow. Your lungs will age faster than normal aging process of people who don't smoke. As the smoke destroys your lungs you also lose blood vessels which are essential for carrying oxygen throughout your body. If you have a weak stomach, you may not want to look at the following pictures. If you are a smoker, you will want to stop. The no.1 image is that of someone who has been smoking for 15 years. As you can see the lung has been covered in black spots. The lung below is that of someone who has been smoking for 30 years. 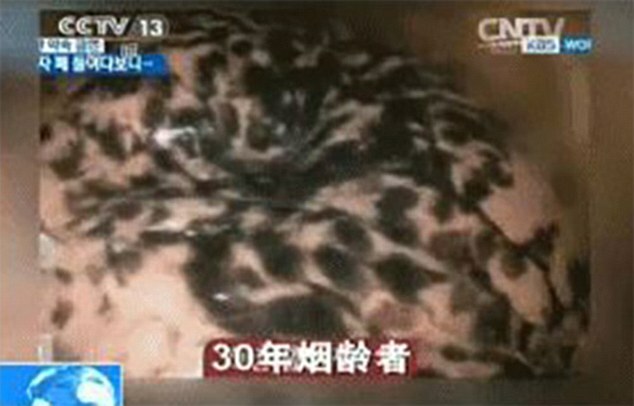 Notice, after 30 years the inside of the lung has become covered with cancerous spots as well. A healthy lung is reddish in color. After smoking for many years the chemicals from the cigarettes stick to the lungs turning them a black color. This is because the lungs act as a filter protecting your body from harmful chemicals. Instead of them entering into your airways, your lung absorbs them. Yet, these chemicals cause cancer within your lungs. In this image you are not seeing the black carbon deposits; rather you are seeing the holes caused by those deposits. The carbon has broken down the alveoli and created large sacs which shrink your lungs. As your lungs get smaller they are not able to exchange as much oxygen throughout your body causing you to have issues breathing. 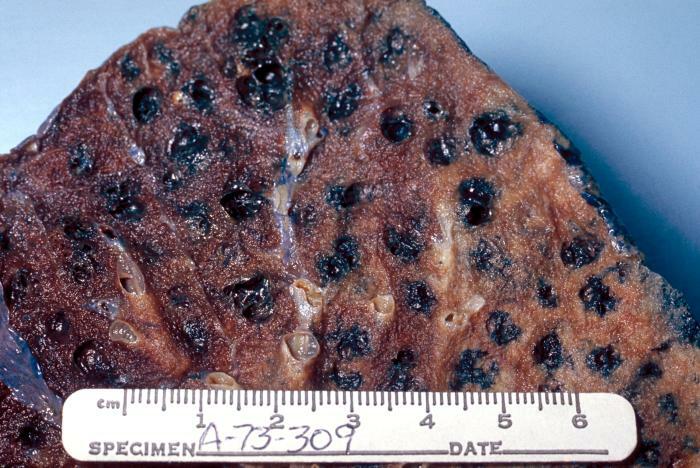 The last of the smoker's lungs pictures shows the cancerous spot within the lung more clearly. An image of a healthy lung will be clear without cloudiness or large spots. Have the smoker's lungs pictures above created a desire within you to quit smoking? The good news is that you can quit smoking in five easy steps. Step 1: Become committed to stop smoking. This is much easier said than to be done, but smoking will damage your lungs and blood vessels. Just start with a commitment to yourself. Step 2: Keep a journal. Write down all the reasons you want to quit. Every time you want to smoke read through them or write them again. Step 3: Prepare for withdrawal symptoms. You are addicted to the nicotine and you may find it difficult when the withdrawal symptoms begin. Just prepare in advance for such symptoms like bad tempers or wiliness of smoking again. You can find some substitute like patches, candies or gums to pass through the withdrawal period, be it as several days or a week. Step 4: Get help. There are many free resources and paid resources which you can sue to help you quit. It is also important that you turn to your loved ones for support. Step 5: Know that 50% of all smokers quit. This is a great motivator, plus it shows that you can quit too. When you start to quit, you are heading to better health conditions in your following days.